Save the Family Support Program! Easter Seals, in collaboration with Self Advocates Becoming Empowered (SABE), is hosting a series of monthly conference calls on Family Support. Each call is designed for families of children with developmental disabilities and self-advocates to learn more about family support options, as well as how to advocate for service improvements. This is the first in a series of family support conference calls; additional calls will be held on the third Wednesday of each month. For call-in information, please register at http://www.directeventreg.com/registration/event/40554288. Governor Bredesen is holding public departmental budget hearings this week. The Division of Intellectual Disability Services, which oversees the Family Support Program is scheduled to present their budget recommendations from 1:00pm to 1:45pm on Thursday, November 19. The hearing will be held in the State Capitol Building. As of today, the State of Tennessee anticipates a budget shortfall in the range of $1.5 Billion dollars in the coming fiscal year. This represents a 9.4% cut from the $26.3 Billion budget Governor Bredesen presented to the legislature last year. We now have authoritative documentation that the Division plans to submit a budget of only $202,100 to the Governor for the entire statewide Family Support Program. Last year, the budget for the program started at $7.67M dollars. During the year, the program was cut by $1M. This appropriation means that the Family Support program will be cut by 97% if the Division’s budget is allowed to stand. The Tennessee Family Support Program serves citizens with severe disabilities, many of whom have few, if any, other resources. At present, it is the only program that serves “gap” populations, including persons with developmental disabilities other than intellectual disabilities, as well as certain middle income families who do not qualify for government supports even though these households are bearing extreme disability-related costs. The Governor’s Budget hearings are open to the public. Please attend. Write Governor Bredsen and ask him to include the Tennessee Family Support Program in his budget when he presents it to the State Legislature. Visit and write your local legislators before they return for the January session and let them know how much the Family Support program means to you personally. Ask them to preserve and protect funding for the Tennessee Family Support Program. If you cannot attend, you can watch the hearing online at http://www.tennesseeanytime.org/gov/budget. 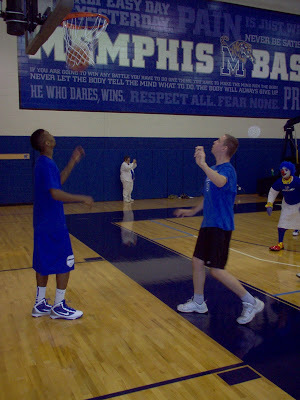 One of our CDJP graduates, Steven Beckham (pictured on the right with U of M basketball player, Doneal Mack, on the left), recently participated in a basketball camp hosted by The University of Memphis and Memphis Tigers men's basketball coach, Josh Pastner! Students and adults from various agencies throughout the Mid-South were invited to participate in a one-day basketball camp on Saturday, November 7th. Thanks to The University of Memphis and Coach Josh Pastner for your vision and support of The Arc's mission! The Arc kicks off 2009-2010 membership drive. 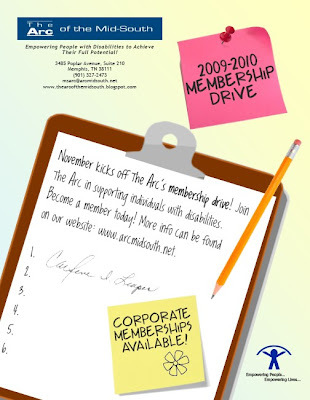 Memberships are an important source of funding for The Arc's programs and services. Join us today! Click here to submit a membership form online!